John Christopher Wood (7 April 1901 – 21 August 1930), also known as Kit Wood, was an English painter born in Knowsley, near Liverpool. Christopher Wood was born in Knowsley to Doctor Lucius and Clare Wood. He was educated at Marlborough College in Wiltshire, then briefly flirted with medicine and architecture at Liverpool University before pursuing an artistic career. At Liverpool University, Wood met Augustus John, who encouraged him to be a painter. The French collector Alphonse Kahn invited him to Paris in 1920. From 1921 he trained as a painter at the Académie Julian in Paris, where he met Picasso, Jean Cocteau, Georges Auric and Diaghilev. He travelled around Europe and north Africa between 1922 and 1924. By the 1920s his father was running a general practice in Broad Chalke, Wiltshire, and Wood painted a series of canvases there including Cottage in Broadchalke, Anemones in a Window, Broadchalke, and The Red Cottage, Broadchalke. 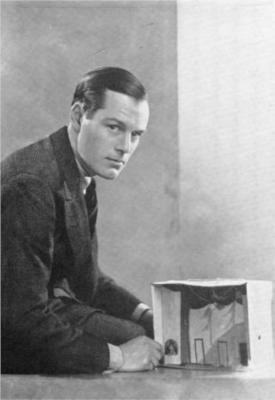 In 1926 Wood created designs for Constant Lambert's 1925 Romeo and Juliet for Diaghilev's Ballets Russes, although they were never used. The same year he became a member of both the London Group and the Seven and Five Society plus meeting and befriending Ben and Winifred Nicholson. 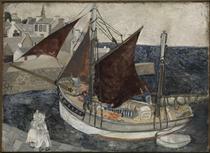 The Nicholsons' dedication to his work had a great influence and they subsequently painted together in Northumberland and Cornwall, then exhibited together at the Beaux Arts Gallery in April–May 1927. 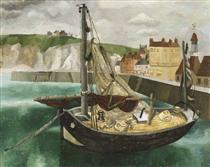 Like Nicholson, Wood admired Alfred Wallis whom they met on a trip to St Ives, and whose primitivism influenced Woods' stylistic development. 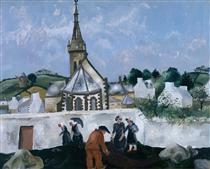 He painted coastal scenes, and his finest works are considered to be those painted in Brittany in 1929. He claimed that his "mother's people were Cornish and that he got his love of the sea and for boats from his Cornish ancestry". In May 1930 he had a largely unsuccessful exhibition with Nicholson at the Georges Bernheim Gallery in Paris. In June and July he made a second sojourn to Brittany to create new work. Later in July Wertheim travelled to meet Wood in Paris, to choose the paintings for a one-man show that would be the opening exhibition at her new Wertheim Gallery in October. While discussing the exhibition over lunch the day after her arrival, Wood issued her with an ultimatum: "I want you to promise to guarantee me twelve hundred pounds a year from the time of my exhibition, one hundred pounds a month being the least I can live on. If I can't have this sum I've made up my mind to shoot myself". When she complained, he begged her forgiveness, and they went to review the paintings again. 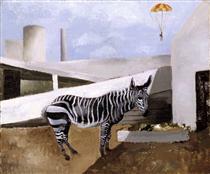 Following his death in August the show was cancelled; it was eventually staged as a memorial show at another gallery.